The Toronto Raptors postseason is locked in. For the first time since '08, the Raptors clinched a playoff berth with a 105-103 win over the Boston Celtics on Friday night, and now there's a big ol' 'X' marked by the Raptors in the standings. Amir Johnson grabbed the offensive board scored the game winning basket with seven seconds to play to seal the win for Toronto over a pesky Boston Celtics squad. 6 It took six years but the Toronto Raptors are back in the playoffs. They're also guaranteed at least a .500 record which hasn't been achieved since the 2007-08 season. 16 DeMar is primed and ready for the playoffs. He put up his sixteenth 30+ point game of the season and finished with 30 pts, 6-6 FT, 4 assists and 3 rebounds. 2:00 There was a scary moment for Kyle Lowry who went down with 2:00 to play in the second quarter with what looked to be an ankle injury but returned to action in the second half. 499 This playoff clinching win was Lowry's 499th career game. 90.9% The Raptors shot the ball well from the free throw line, going 20-22. 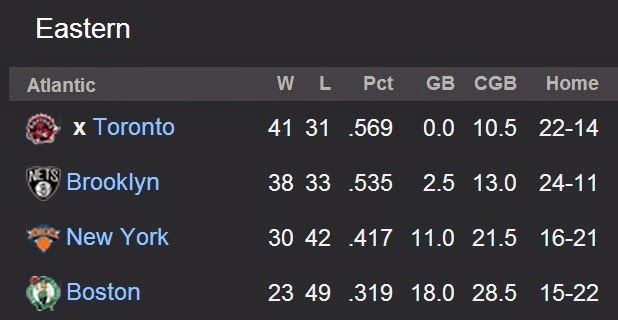 0.5 Toronto moves a half game over the Chicago Bulls and are holding down the #3 spot in the East. 1 One phone call from Amir's grandmother. 8-27 The Celtics dropped to 23-49 on the season and 8-27 on the road. 31 Canadian Watch: Kelly Olynyk finished with 10 points in 19 minutes of play. 14 Former Raptor Jerryd Bayless scored 20 points against his former team, with 14 points coming in the fourth quarter. 2008 Jason Kapono, TJ Ford, Rasho Nesterovic, Jose Calderon, Chris Bosh, Sam Mitchell....this was the last time the Raps were in the postseason. 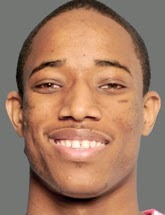 Pound The Rock Star of the Game: DeMar DeRozan - 30 pts, 6-6 FT, 4 assists and 3 rebounds.